Shopping for comfortable, long-lasting youth baseball pants does not have to be a pain. At Shop4teams you will get at least 25 percent off quality custom baseball pants from such brand names as Augusta, Holloway, High Five and Teamworks. From recreation leagues to pro, we carry about just about every style to suit every just about taste and level. 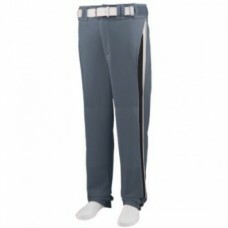 Whether you want white, grey or black baseball pants, solid color to classic pinstripe baseball pants, traditional fit or comfortable baggy, ankle length baseball pants, your league will find the perfect pant at our online store. Let Shop4teams help you bring you’re a-game and save more than ever on name brand baseball clothes and accessories. Size Chart 11 ounce 100% polyester double knit * Relaxed fit - full cut with longer inseam an..
click here for Size Chart 14 oz 100% polyester double knit * Relaxed fit - full cut with longer i.. Size chart . Dry-Excel Defend Performance Double Knit, 15oz. polyester with wicking and soil-re.. Size chart . Dry-Excel Defend Performance Double Knit, 15oz polyester with wicking and soil-rel..